The runway at Bristol Airport has reopened after snow caused it to close for several hours. About 2in (5cm) of snow fell widely across the city on Saturday morning with more reported in rural locations to the south of Bristol. The airport closed early on Saturday and reopened by 0800 GMT. First Bus reported buses were suspended in Bath and Weston-super-Mare where some roads were "impassable" but Bristol services were mostly running. Karen Baxter, from First Bus, said the conditions in some parts of the region meant they could not run services. "The snow outside is significant and the roads just aren't passable," she said. South West Trains said services between Bristol Temple Meads and Salisbury were cancelled for the whole of Saturday because of the poor weather conditions. The M5 southbound between junction 21 at Weston-super-Mare and junction 22 at Burnham-on-Sea has now been cleared after a jack-knifed lorry blocked one lane for most of the morning. 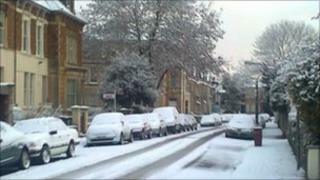 The snow has also affected football matches in Bristol and Bath. Bristol Rovers have cancelled their game due to fears for spectators' safety. Dave Harper, safety officer for Rovers, said: "The pitch is absolutely perfect - the pitch was covered and is perfectly playable. "It's just basically the car park, the terracing and the walkways at the back of the stand. "It's too dangerous - it's just like an ice-rink - there's no way you can get spectators in there." Bath City have also called their match off with Colchester.